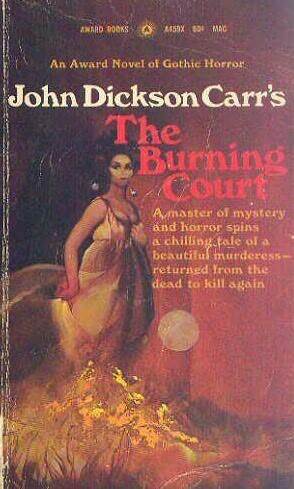 It was pretty hard to write an introductory passage to this entry without spoiling too much of the fun that I experienced while reading this famous John Dickson Carr novel. And this one really deserves it’s place as one of his best mysteries outside his famous detective-series’. I found this one to be so tightly paced that I almost couldn’t put in down and read the 2nd half in just one evening. Some of my praise may come from my appreciation of a hybrid between Detective-Mystery and Horror, two genre I like very much as this blog should prove. But I want to try and explain a little further why I liked this story so much, without spoiling to much of the fun (and everybody be warned to never read the lower part of the English Wikipedia entry as it spoils everything). So we have a pretty classical scenario for 1930’s detective-fiction: An old man who is poisoned and dies in what is practically a locked room, while all people involved have cast-iron alibis. But what makes it interesting is, that the plot does not start here, but with the mysterious photography of a woman sentenced to death for poison-murder, which serves as a bridge between the mysterious past and the gruesome present. The atmosphere from the very beginning is not that of a logic driven puzzle, but that of a ghost story, a gothic novel about the past threatening the stability of the present, which could as well have sprung from the feather of Edgar Allan Poe (the similarity in atmosphere and setting to some of his works, like “The Fall of the House of Usher” is striking). Still, while the story remains a certain supernatural air to it, it also demands for the reader to find a logical solution. The most discussed part of the novel is it’s final solution. It was almost hated, but at least heavily criticized when it was released, but today it is regarded as a very fine example of crossing genre-borders without actually breaking the rules. I found the solution almost perfect, because it didn’t break the atmosphere, but it provided a way by which the reader himself has some freedom of decision. Again it was a case where the solution almost stared into your face, when you knew how to connect the dots, yet it remained obscure enough that the reader, just as the detective characters, had to be quite bold in his approach. I got the murder almost solved, apart from some of the red herrings, but I was too dense to solve the mystery of the crypt in a believable fashion. I was slapping my head in the end when I saw that it was not at all impossible. And I have to praise Carr for historical research on poisoning and witchcraft. While reading the story I tended to check some things he included and he actually used historical characters in his background story. Especially the case of Marie d’Aubray and Sainte-Croix was interesting even outside the realm of the plot. Historical mysteries often tend to pass by me, but this one actually got me, especially because it didn’t feel forced to me. All in all this is something that would probably be categorized as 怪奇ミステリ in Japan today, but I would say that it is just as much 本格ミステリ. Carr is really advancing towards the top of my favourite authors with his atmospheric and yet still lively storytelling and his interesting cases. ~ by seizonsha on 2011/04/12.